Six Sigma is a scientific methodology that strives to achieve perfect quality in the eyes (a.k.a. Voice) of the Customer. It's a structured performance improvement process that has nothing to do with martial arts other than the names were taken to dictate the levels of expertise. The terms White Belt, Yellow Belt, Green Belt, Black Belt, and Master Black Belt are terms given to individuals that practice the Six Sigma methodology. Perfect takes on various standards depending on the industry, process, service, or customer. 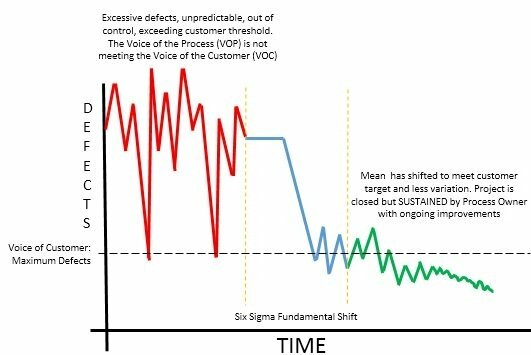 Six Sigma performance is generally considered the standard for perfection but this level of performance may not always meet the customer expectations. Having a defect rate of six sigma can represent perfection in some areas and not for others. If the process involves life dependent or critical products then this rate of defects is not going to be acceptable, it is not good enough. In other cases the unnecessary precision may be too expensive to achieve at least six sigma performance. Quality has a wide array of definitions, it can relate to reducing defects, reducing inventory, improving scorecards, morale, and creating new products and services. Customer also has a diverse scope consisting of the end-users, downstream operators, the company, and lost or potential end-users. The methodology uses statistics to help make decisions (along with subjective reasoning and some common sense) rather than just someone's intuition or gut feeling. The use of statistics also shows magnitude of change and increases the level of information to a company. 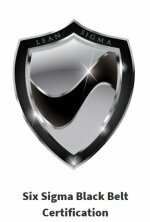 Working as a Six Sigma project leader can be a very rewarding and well-paying career. Often Green Belts, White Belts, and Yellow Belts are trained in the principles but retain their original job while using the basic principles in their daily work. The Master Black Belt is a subject matter expert and the Yellow and White Belt are the novice. Six Sigma programs aim to be proactive by applying an array of statistical tools to understand the impact of all key input variables causing the variation of a process (in the case for DMAIC project) or create a defect free, minimal variation product or process at inception (in the case for a DFSS - Design for Six Sigma). With the tools, a Green Belt or Black Belt, can guide the cross functional team to focus their efforts around controlling the critical inputs to deliver repetitive, customer satisfying, low-cost products, processes, and services. The tools (and correct interpretation) will help direct the team's decisions to the most effective and efficient improvements. This avoids losing valuable time on the lesser significant inputs to not only improve the process but in an very efficient way. Sigma is a measure of the process variability or spread. The higher the sigma level the fewer defects the process creates. Six sigma performance is a long term (future) process that creates a level of 3.4 defects per million opportunities (DPMO). If the area under the normal curve represents one million opportunities then approximately 3.4 of them would be outside of the customer specification limit(s) when shifted 1.5 sigma to account for all the short term shifts. A six sigma process refers to the process short-term performance or how it is performing currently. When referring to DPMO of the process, we are referring to long-term or projected performance behavior. A six sigma level of performance has 3.4 defects per million opportunities (3.4 DPMO). A current six sigma process now will have a estimated shift of 1.5 sigma (lower) in the future and will perform at a 4.5 sigma level, which produces 3.4 DPMO. A typical process has been proven to have a shift in its average performance of up to +/- 1.5 sigma over the long term. A long term Six Sigma process that is rated at 4.5 sigma is considered to have a short term sigma score of 6 sigma. The combination of all the short term samples that make up the long term performance will create no more than 3.4 defects per million opportunities. and sustaining a process mean shift of up to 1.5 standard deviations (sigma). The methodology focuses on variation reduction within a process and designing new processes or products that will perform at a near perfect and consistent level over the long term. The real motivation for implementing a Six Sigma program is to make more money. Six Sigma strives to improve customer satisfaction, increase sales, reduce defects but all those are leading indicators to profitability which is the ultimate goal. The methodology not only strives to maximize profits but ensures stability in those returns and predictability. It alerts companies if conditions are going out of control before the bottom line goes out of control. The above formula simply states that a process output (Y) is a function of it inputs. Too often companies measure the Y to heavily and focus on controlling just the Y rather than focus the inputs and this can create conflicting focus across the company on too many inputs or not the most vital inputs. While the outputs are important, Six Sigma focuses on controlling the inputs to get an output the has minimal variation, is on target, and meets the customer specifications. There may be a few to several thousand inputs. The Six Sigma team's job is to identify and prioritize them through subjective and statistical analysis for improvement opportunities. Then, a relentless drive to improve and SUSTAIN the improvements prior to closing the charter. Not every process will end up at 3.4 DPMO (6 sigma) and it may not be necessary or it also may not be good enough, depending on industry and critical nature of process. However, by controlling the KPIV (key process input variables) the team makes a fundamental shift to meet and exceed customer expectations and most important, SUSTAINS the gains.